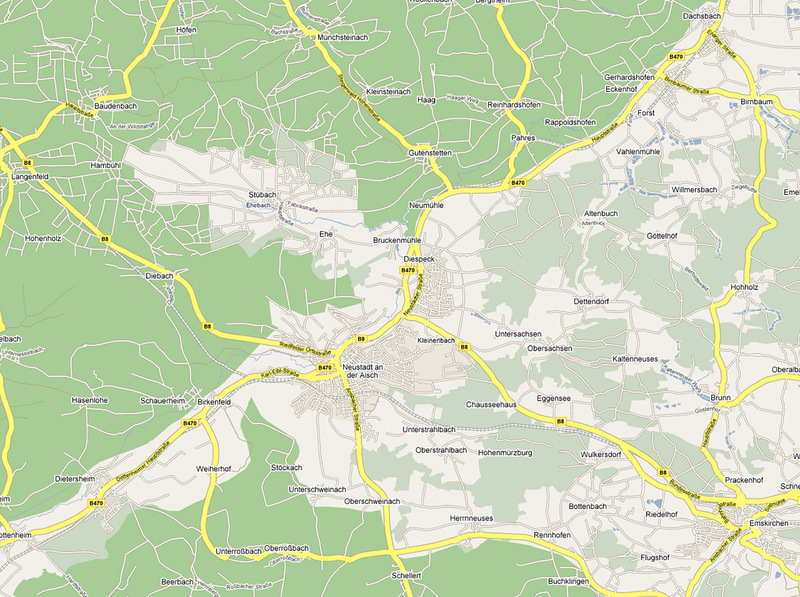 This is the ancestral Hasselbacher heartland of Germany. My first Hasselbacher was one of three brothers who immigrated from Grestin, Austria around 1650 to the villages of Unterrossbach and Oberrossbach. They were part of the Exulanten: religious refugees from Austria in the counter-reformation following the Thirty Years War. My ancestral Hasselbachers were descendants of Wolf Hasselbacher whose Grandson and Great-Grandson in the early 1700s settled in Diespeck. They and their descendants married into families from many of the towns you see above. My immediate family immigrated to the USA in 1924 through Nuremberg. Also immigrating directly from Diespeck in the 19th century were the Red Cloud, Nebraska and the Cincinnati Hasselbachers. Those families are related to me as are the Illinois Hasselbachers who originated from a family that had migrated west through the area of Emskirchen and Puschendorf to Herzogenaurach. The large Hazelbaker family of the USA was founded by an earlier Peter Hasselbacher who was born in the village of Munchsteinach. Details of these existing families and families that are lost to me (at the moment) will be presented elsewhere in these pages. Altheim can be seen at the very lowest left of the map adjacent to Dottenheim. Wolff Hasselbacher and Agatha had their first recorded communion in Franconia in Alltheim.